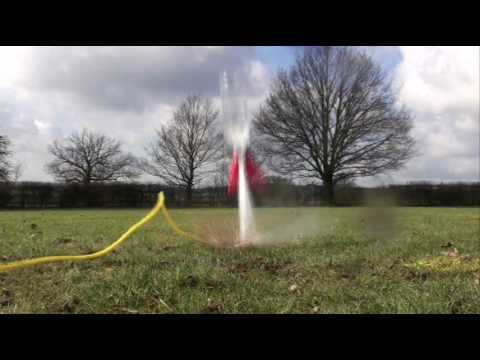 The Rokit Water Rocket Kit is a precision water rocket used by schools and colleges throughout the world to demonstrate the Laws of Motion. Attach the Rokit to a standard plastic fizzy pop bottle, part fill with water and use a cycle pump to power it for automatic launch! This exciting kit has the capability of providing repeatable experiments. Rokit flies to around 30 metres (100ft) which creates great fun in learning science - it's a valuable and visual tool for all levels of science education. This kit is also available with the bottle included as the Rokit Water Rocket and Bottle kit. Fantastic fun for all the family in the garden. Highly recommended. Excellent product. Educational and fun. Wonderland Models delivered it speadily and efficiently - thanks. I was going on a camping holiday recently with my children and bought this water rocket to give the children something fun and educational to play with. I was not disappointed! The Rokit water rocket gave them hours of fun as both they and all the other kids in the campsite spent hours launching and relaunching it. We had to replace the empty two litre coke bottle a couple of times because it was used so much!! I would highly recommend this rocket for anyone looking for outdoor fun for both adults and children alike. My 13 year old son and 33 year old husband absolutely love this. Great fun and works really well. This product has been around for ages, I am 34 and had one by the age of 10. It seems as though it has changed a little and it really is great fun for parents too, as well as scientific. Personally I put slightly more water than the 1/4 recommended (about 1/3) which leads to longer fly times. It is the best fun I have had in ages, cheap and ever stocking MUST have one! The Rokit - fabulous fun. Excellent piece of kit that the kids all love. Great for explaining water/air pressure, but just as good just for fun. Very good, does exactly what it says on the tin.your own re-usable spacecraft. Still going strong after dozens of launches.